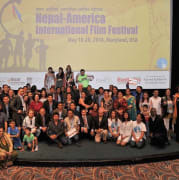 Nepal America International Film Festival (NAIFF), an annual film event organized by Nepal America Film Society, a 501(c) (3) non-profit organization, is looking for volunteers from Washington DC metro area (Maryland, Virginia and Washington DC). The 2019 Film Festival is taking place from 28-30 June 2019. We will welcome volunteers who have commitment and passion for supporting art, culture, and cinema. The Volunteers will have a key role to make a successful film festival event. We have volunteer opportunity based on your time schedule, commitment and enthusiasm. Certificate of appreciation will be given at the closing ceremony. Will get a free pass during the film festival and other events of the film society. Will be invited to the special program of the film society. Will gain incredible working experience. Please apply soon with a letter of interest and short CV by email. If you need further information, please contact us at nafilmsociety@gmail.com.